This is the last installment of a four-part series on Twitter widgets. 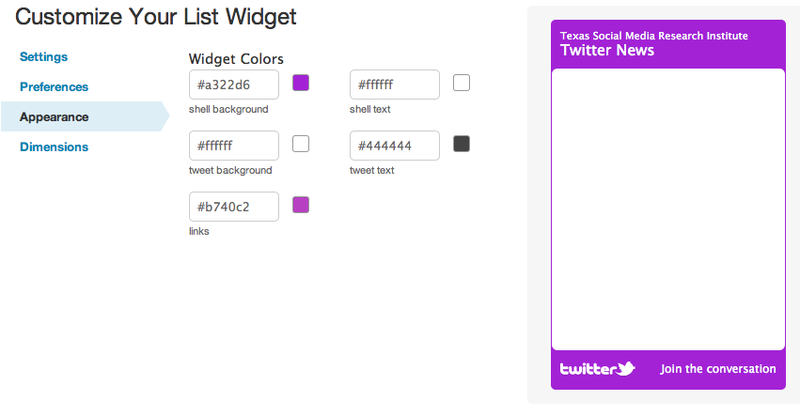 A Twitter widget is a piece of code you can put in your website or blog that displays part of your Twitter profile and information. A profile widget displays your basic Twitter profile information. A search widget displays real time search results for any word or phrase you choose. A favorites widget displays the tweets that you have favorited. Today we'll be discussing list widgets. List widgets display the Twitter usernames of people or companies your lists, such as "Breaking News" or "Thought Leaders." This can give others insight into your personality or even some helpful resources. If you have not created any lists yet, here's a good primer on doing so. 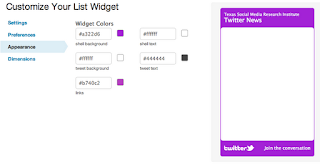 Here's how to create a Twitter list widget. 1. After you log into Twitter, click on Resources at the bottom of the page. 2. Select See All Widgets and My Website. 4. Type in your username. Click on Find Lists. 5. The Appearance feature will help you change the appearance of your widget to match your website. 6. If you want to change the size of your widget use the “Dimensions” tab. Please note that the size change will not be previewed until it’s finalized. 7. Once you are ready to preview what your Widget would look like, you can select “Test Settings” to make sure everything looks the way you want it to. 8. When you are ready to get the code to put on your site or blog, select “Finish & Grab Code” at the bottom of the page.